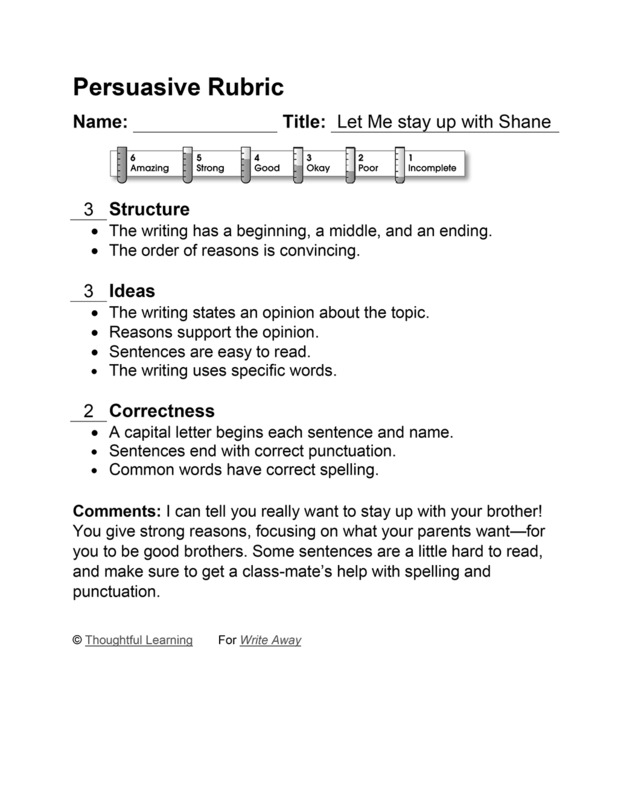 This model of second-grade persuasive writing argues for a later bed time. I am 7 and I haf to go to bed at 8 but Shane is 9 and he has to go to bed at 9. Why don't I go to bed at 9. Then I can stay up and play. We will be better brothers to play to gether like you all ways say. So let me stay up with Shane. Pleas I love you. Let Me stay up with Shane by Thoughtful Learning is licensed under a Creative Commons Attribution-NonCommercial-ShareAlike 4.0 International License. Based on a work at k12.thoughtfullearning.com/assessmentmodels/let-me-stay-shane.